It’s safe to say that we all want to be amazed on our trips to tropical islands. Because of the crazy speed of life in the 21st century, we don’t really get much time for traveling. So, whenever we do, those resorts better be great! Lombok is not as recognized as Bali, its neighbor – the lovely Indonesian beauty – but it’s slowly and steadily becoming more and more popular. In this review, I want to tell you about the Batu Payung beach that’s located in the south-eastern corner. Go ahead and check it out on the map. It looks pretty awesome doesn’t it, especially given the fact that you’ll be facing the majestic Indian Ocean while standing on the shore? The super-tiny Gili Anakanjan is located right in front of it, and you can even swim your way to it if you want. Obviously, a boat is a far better choice, but I think you get the idea. This part of Lombok is truly magnificent and the entire coastline is covered by beaches. And, unlike most secluded areas on the island, this one is rich with all kinds of cafes and restaurants. From Batu Payung, you’ll have to walk less than one kilometer to get to them (that’s gonna take +/- 10-12 minutes). Just imagine sitting in one of them with your friends and enjoying a delicious local meal with the best view in the house. The island forms something of a half-circle there and looks fantastic. What Is The Batu Payung Beach All About? The bottom line is – if you want to be amazed by Lombok but have been to similar places before, the big, noisy, and crowded spots like Senggigi and Kuta might not be as attractive for you as for the average tourist. You could try to visit the secluded villages with the kind and helpful locals or check out the majestic Mount Rinjani. But we usually love to go to the beaches, as that’s where all the fun is. And Batu Payung will give you more than any other average beach on this island. That view alone is enough to make it worth the while. I mentioned Kuta earlier – it is the bigger and more popular “sibling” and is approximately 7 kilometers away. On a car/bike, it will take less than 30 minutes to get there. I’d highly recommend switching between these two spots (or even more) and following your heart. Say, whenever you crave some party vibes, head straight for Kuta and have the time of your life. And when the mood changes and you strive for peace and quiet, the Batu Payung beach will be waiting for you on the other side of the island. Lombok isn’t particularly big and can be crossed in 3 to 4 hours. That’s one of its biggest selling points: in order to see the best parts, you won’t have to travel there a dozen times. Even one trip can be enough for a foreigner to check out the most popular spots. If you want to take the best pictures in the world (for you, anyway), make sure to wake up early – like really early. Or, wait until the sun goes down and it becomes hard. That’s when the majority of the locals and the tourists will leave and you’ll get a chance to make some awesome selfies without random people messing up your pics. I have to say that the place looks magical in the morning, especially when the sun is just rising and you can feel it shedding light on the entire coastline. Keep in mind, however, that it might be a bit cold then; no, I’m not saying sweaters and jackets are a must, but still, keep yourself warm. The sad part is – even though Batu Payung isn’t the most popular spot in Lombok, there will be some vendors on the beach trying to sell you stuff nobody really needs. Senggigi and Kuta are a lot worse, actually. The best course of action would be to buy something cheap so that they’ll leave you be. Renting speedboats and yachts is a popular thing to do in this area. They aren’t particularly expensive but the ride will create tons of amazing memories. Just imagine yourself on a fancy yacht conquering the waves and drinking coconut juice. It is experiences like this one that make our foreign trips worth it. Surfing, swimming, and diving are also available. What Is There To Do At This Beach? Actually, I just answered that question. Along with the water activities, the Batuy Payung beach is also good for just lying under the sun and reading a nice book. The cafes/restaurants/warungs serve delicious meals and drinks for cheap; the locals are friendly (except for those vendors, of course). A lot of people prefer to rent boats in Tanjung Aan and get to the Batu Payung beach that way. Keep in mind, however, that the journey on a boat might be a bit dangerous because of the waves. Remember that and always check the weather. Better safe than sorry, you know? The prices change all the time, but the local boat owners usually charge no more than 10 bucks for a person. Plus, they provide discounts for groups. As a friend of mine likes to say, te entire island is very “instagrammable”, and this spot is certainly in the top-3 of the most picture-friendly places. There are some cliffs of average height in the area and I’d say that you’ll be able to impress your buddies with the photos you take from up there. The sunsets are beautiful; the atmosphere is amazing; even though there aren’t any eating spots at the beach, you’ll always find them in the vicinity. Apart from that, Batu Payung doesn’t really have anything more to offer. Again, Kuta is where the action is; Tanjung Aan is the golden middle. So, now we know that we can reach our destination on foot, behind the wheel of a car/bike, and also on a boat. And, there’s no need to worry about food/drinks/other stuff, as there are enough warungs and “convenience stores” in the area. Same goes for the hotels/guesthouses. You might have to walk for a while to find one, but that won’t take more than 10-15 minutes. As always, Lombok offers the tourists a wide range of prices. The rich folks will get to enjoy the more expensive, luxurious “villas” with amazing views and top-notch service. People on a budget will still have a chance to chill in the middle-class hotels. Regardless of your choice, everything will be nice and cozy. This island is not new to welcoming foreigners and the locals know exactly how to help the visitors have a good time. One last thing: I’m sure you’ve already seen that famous big rock in the middle of the island. Obviously, it’s a very popular landmark for taking pictures, but you need to be careful, because the beach is slippery, especially after it rains. I was really excited about it at first but then it turned out to be a bit of a disappointment. In any case, the pictures look amazing. Remember: there is no white sand in Batu Payung: only a coastline covered in stones. If you’re an experienced tourist, you won’t really need my help to get there. The newbies, however, will be happy to learn that even when GPS is not working (that’s a regular thing in Lombok) and you can’t seem to remember the right way, the taxi drivers will take you there for the right price. It’s always better to know some Sasak so that they won’t be able to “dupe” you. On the other hand, compared to the US/EU, the prices in Indonesia are very low. Just say the name of the place you want to visit and they’ll do the rest. The International Lombok Airport is pretty close to Batu Payung. You’ll only have to drive for approximately one hour. There are two routes available: through J. Kuta Lombok and through Jalan Sengkol – Mujur. It’s always safer to choose the longer route as it’s less crowded by cars. If you’re driving a rental bike, that’s exactly what you’ll need. We talked about Kuta earlier. From Mataram, the road is 1 hour and 20/40 minutes long. Again, it all depends on the route you pick. Through Jl. Bypass Bandara Int., it is 58km long. The longer route is 63km long. At the end of the day, it doesn’t really matter how you get there. What matters is how much fun you’ll have on the way! The boat ride was fun and relatively cheap. The locals were friendly and even a bit surprised to see us. Just another average beach or a hidden treasure? A little bit of both, actually! On the map, the distance between Kuta and Batu Payung seems tiny. But in reality, it's pretty huge. 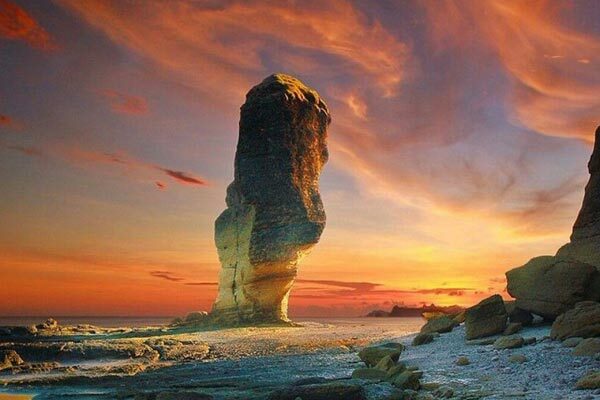 The umbrella-like rock is the star of the show at this beach. I've never seen anything quite like it. I really loved that rock! It's a bit "alien" and looks good on the photos.